Citation Information: J Clin Invest. 2005;115(2):326-338. https://doi.org/10.1172/JCI22326. We have identified a subpopulation of stem cells within adult human BM, isolated at the single-cell level, that self-renew without loss of multipotency for more than 140 population doublings and exhibit the capacity for differentiation into cells of all 3 germ layers. Based on surface marker expression, these clonally expanded human BM-derived multipotent stem cells (hBMSCs) do not appear to belong to any previously described BM-derived stem cell population. Intramyocardial transplantation of hBMSCs after myocardial infarction resulted in robust engraftment of transplanted cells, which exhibited colocalization with markers of cardiomyocyte (CMC), EC, and smooth muscle cell (SMC) identity, consistent with differentiation of hBMSCs into multiple lineages in vivo. Furthermore, upregulation of paracrine factors including angiogenic cytokines and antiapoptotic factors, and proliferation of host ECs and CMCs, were observed in the hBMSC-transplanted hearts. Coculture of hBMSCs with CMCs, ECs, or SMCs revealed that phenotypic changes of hBMSCs result from both differentiation and fusion. Collectively, the favorable effect of hBMSC transplantation after myocardial infarction appears to be due to augmentation of proliferation and preservation of host myocardial tissues as well as differentiation of hBMSCs for tissue regeneration and repair. To our knowledge, this is the first demonstration that a specific population of multipotent human BM-derived stem cells can induce both therapeutic neovascularization and endogenous and exogenous cardiomyogenesis. Characteristics of hBMSCs. (A) Phase-contrast and fluorescent images show a single cell per well. Original magnification, ×400. (B–D) Cells were analyzed with a FACStar flow cytometer. (B) Morphologically, most hBMSCs demonstrate round morphology with a cell size of less than 15 μm in diameter. Scale bar: 100 μm. 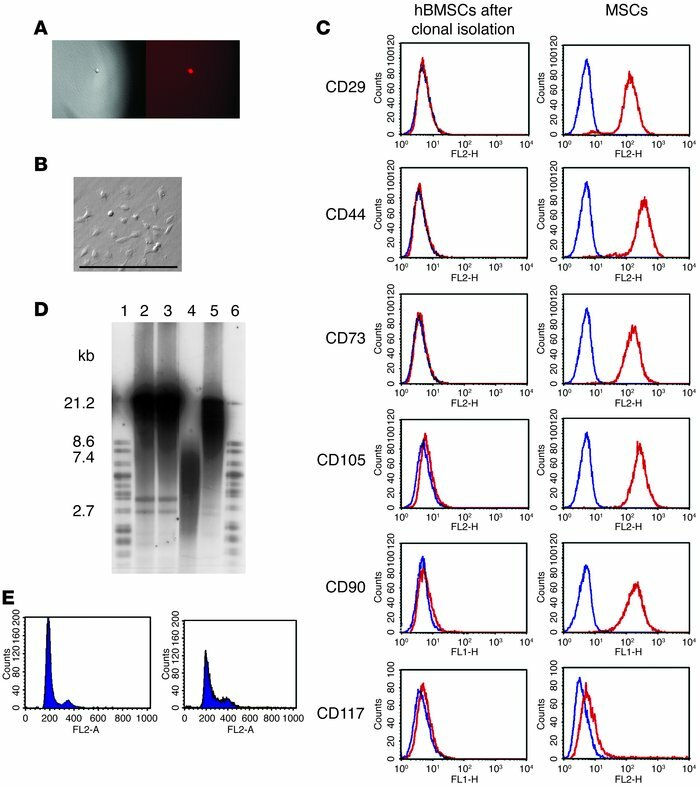 (C) Clonally isolated hBMSCs cultured for 120 PDs were labeled with PE- or FITC-conjugated Abs against human CD29, CD44, CD73, CD105, CD90, or CD117, or Ig isotype controls. Blue lines, control Ig; red lines, specific Ab. Clonally isolated hBMSCs showed only minimal expression or no expression (<3%) of CD90, CD105, and CD117 (C). In contrast, the purchased MSCs expressed significantly higher levels of CD29, CD44, CD73, CD105, CD90, and CD117. (D) Mean TRF length of hBMSCs cultured for 5 PDs (lane 2) and 120 PDs (lane 3). No difference in mean TRF is shown. Human umbilical vein ECs (lane 4) and immortalized cell lines with high telomere length, provided by the Roche Diagnostics Corp. (lane 5), were used as controls. Lanes 1 and 6, molecular weight standards. (E) DNA ploidy analysis. hBMSCs were stained with propidium iodide and subjected to FACS analysis. Representative examples of hBMSCs cultured for 20 (left panel) and 140 (right panel) PDs demonstrate no evidence of overdiploid DNA content. Similar experiments were performed at least 3 times (A–E).